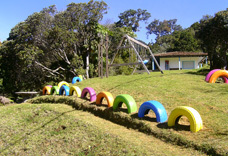 For families with children visiting our cloud forest lodge, we have besides special rates for little children also a playground in the open air, probably the playground with the best view in Costa Rica. Parents can sit at a table enjoying this beautiful view, while the children play next to them. The playground consists, among others, of a large trampoline, a swing and horizontal bars. We also provide toys for your youngest children, in case you are interested in using them during your stay, please ask for them at the reception. Rhiannon, Sebastiaan, Emma and Macsen Davies- Ambtman.